Towleroad: What's surprised you most about the success of the show? 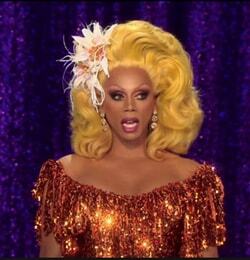 RuPaul: What's surprised me the most is that it's not bigger. I'm surprised it's not The Voice numbers and what American Idol used to be. I'm surprised it's not more people, but you know what? I ain't complaining. TR: How do you think the show has evolved since the beginning? TR: What's the impact been on you acting as a judge and matriarch on the show? RP: Well, my favorite thing about doing this is creating a forum for these kids to show themselves to the world and to become international stars. We're in over 100 countries around the world. How it's changed me, though, is … is it even possible for me to have more compassion? I guess so. It's actually softened me. It's softened me to allow people to just be themselves. It's opened my heart. I was actually driving to the office today thinking the solution to every situation is really love. If I close my heart, that trick never works. If I get angry at people and say, 'Damn you,' that trick just never works. It's more important to have compassion, especially at this point in life. I've been around the planet for a few years, it's taken me this long to really understand the power of that. TR: I feel like as a viewer of the show for so long, the tone has shifted a little bit, too. In early seasons, it was more of a satire of Top Model and Project Runway, but the heart of the show has gotten much bigger as the seasons have gone on. RP: I think so, I think so. Drag by design is a parody and a spoof and a piss-take and a wink at everything in culture. That's our job, actually, to take the piss out of everything that our culture takes so seriously. I tweeted this morning that my 10th grade teacher gave me the best advice that's ever been given, which is 'Don't take life too seriously.' And that is really the role of the shaman, the drag queen, the court jester, the witch doctor, to say, 'Oh, and by the way, this is all an illusion. None of this is real.' It's a gift that you really have to enjoy and not let it get the best of you. TR: Carmen Carrera has made headlines as a trans model. You've also had past queens Sonique and Monica Beverly Hillz on the show. I think it's challenged people's understanding of both trans and drag. I'd love to hear your thoughts on the relationship between the trans and drag community. RP: It's always been so confusing for most people, but the bottom line is that there's really only one of us here on this planet. The ego wants to separate everybody. It wants to say, 'You're over there, and I'm over here.' But the truth is we're just really one thing. We are all just one thing. In terms of our show, the only criteria is contestants must have charisma, uniqueness, nerve and talent. TR: I'm curious about the main challenges for the show. What's the brainstorming process like? Where do those come from? RP: The producers here are a bunch of twisted, gay men who are pop culture junkies, who have seen everything that's ever happened in the history of the world, and we remember it, and we somehow incorporate it into the challenges to entertain ourselves. Once you uncover and decode life's twisted hoax, the only sanctuary is in the absurd and the irreverent. The only way to deal with it is to live in that place where everything is so friggin' hilarious. That's how we come up with the challenges, and you know what I'm talking about. TR: Totally. What's been your favorite challenge on the show? TR: Anything else about this coming season folks should be excited about? RP: My new album is just a blast. It's almost a completely duet album, but it has so much great stuff on there. I couldn't be more proud of it. Of course, as usual, a lot of the songs in season six are on my album. TR: And where might that album be available? RP: It's available on iTunes … And Amazon. Come back for our weekly recap of 'Drag Race' after tonight's premiere!